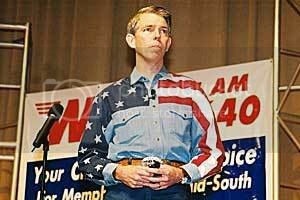 David Barton, the notorious Christian historical revisionist and longtime Texas GOP activist, is once again barnstorming the nation on the payroll of the Republican National Committee. As he did in 2004, Barton is now speaking in churches on behalf of GOP candidates. This past weekend, Barton made appearances with Rep. Bobby Jindal (R-LA) in three Baptist churchesin the Louisiana congressman's district. According to Barton's speaking schedule on the web site of Wallbuilders, the organization he heads in Aledo, Texas, the churches were: Calvary Baptist Church, in Alexandria, Cedar Crest Baptist Church, in West Monroe, and First Baptist Church Bossier City, in Bossier City. For each of the three events, the contact listed is not the church, but Taylor Teepell, at the Jindal campaign. Jindal is being challenged this year by Democrat Stacey Tallitsch. As in 2004, Barton's campaigning seems intended to be mostly "below the radar." In 2004, Beliefnet reported that he was hired by the Republican National Committee to campaign for Bush. The Republican National Committee is employing the services of a Texas-based activist who believes the United States is a "Christian nation" and the separation of church and state is "a myth." David Barton, the founder of an organization called Wallbuilders, was hired by the RNC as a political consultant and has been traveling the country for a year--speaking at about 300 RNC-sponsored lunches for local evangelical pastors. During the lunches, he presents a slide show of American monuments, discusses his view of America's Christian heritage -- and tells pastors that they are allowed to endorse political candidates from the pulpit. Barton, who is also the vice-chairman of the Texas GOP, told Beliefnet this week that the pastors' meetings have been kept "below the radar.... We work our tails off to stay out of the news." But at this point, he says, with voter registration ended in most states and early voting already under way, staying quiet about the activity "doesn't matter." Barton's main contention is that the separation of church and state was never intended by the nation's founders; he says it was created by the Supreme Court in the 20th Century. The back cover of his 1989 book, "The Myth of Separation," proclaims: "This book proves that separation of church and state is a myth." Barton is also on the board of advisers of the Providence Foundation, a Christian Reconstructionist group that advocates America as a Christian nation. "...all section 501(c)(3) organizations are absolutely prohibited from directly or indirectly participating in, or intervening in, any political campaign on behalf of (or in opposition to) any candidate for elective public office." Political campaign intervention includes any and all activities that favor or oppose one or more candidates for public office. The prohibition extends beyond candidate endorsements. Contributions to political campaign funds or public statements of position (verbal or written) made by or on behalf of an organization in favor of or in opposition to any candidate for public office clearly violate the prohibition on political campaign intervention. Distributing statements prepared by others that favor or oppose any candidate for public office will also violate the prohibition. Allowing a candidate to use an organization's assets or facilities will also violate the prohibition if other candidates are not given an equivalent opportunity. Although section 501(c)(3) organizations may engage in some activities to promote voter registration, encourage voter participation, and provide voter education, they will violate the prohibition on political campaign intervention if they engage in an activity that favors or opposes any candidate for public office. David Barton: The activities I do for the RNC are not a lot different from what I do in any other setting. The audience is slightly different, but the message I deliver remains largely the same. What I did for the RNC was particularly talk to the constituency that included people of faith and social conservatives (there's a lot of overlap between the two). I would essentially show the historical and Biblical reasons for people of faith to be involved politically. We also did a number of pastors' conferences giving that same information but also distributing a four page letter from the IRS laying out exactly what churches can and cannot do as 501(c)(3) organizations. I try to clarify a lot of the confusion in this area, because there are several groups on the left that aggressively attempt to intimidate and silence pastors. However, unbeknownst to most of them, there is much that pastors legally can do and still be within the law, since those activities are related to civic engagement. They cannot endorse candidates; they cannot endorse parties; but they can endorse the concept of parishioners being active citizens. Has Barton changed his ways? Maybe. Yes, pastors can certainly encourage people to be active citizens without crossing the line. But the devil is in the details. And given Barton's record of pushing pastors to violate the clear letter as well as the spirit of the law, they should watch out for the details in what Barton tells them. Update [2006-10-26 15:34:8 by Frederick Clarkson]: The blog We Unite Ohio reports that after Barton spoke at the church in Cincinnati, the "surprise" guest was Ken Blackwell, the GOP candidate for governor. Show an important dimension of how the national GOP encourages and promotes Christian nationalism. Doesn't Barton's shirt in the above picture constitute flag desecration? This group has come up several times on this website... some may not be aware that Providence Foundation was originally incorporated in 1984 as a subsidiary of Maranatha Campus Ministries, a group that was considered "cult-like" even by conservative evangelical & Pentecostal/charismatic Christians for its controlling "shepherding" tactics in the 1970s and 1980s. (There is a big difference between truly evangelical Christians and dominionists who are often mistaken for "evangelicals." Maranatha was very much in the latter category, as is its present-day descendant, Every Nation). This is what Maranatha's former leader, Bob Weiner, said about it in his 1988 tome, Take Dominion! Maranatha, as does today's Every Nation, by and large espoused a syncretic millenarian eschatology which blended liberal doses of Christian Reconstructionism with Latter Rain "Manifest Sons of God" theology. It is primarily post-millennial but has elements of apocalyptic pre-millennialism through Latter Rain sources. It wasn't and still isn't totally homogenous - some leaders skew more Reconstructionist, others more Latter Rain - but logically the prevailing theology was and is more a "working theology" than a systematic one since one of the few things that radical Puritan Christian Reconstructionism and radical Pietist Latter Rain-ism have in common is the supposed charge for Christians to "take dominion" before Christ returns. Otherwise, at least among the rank and file, it's like trying to put Wesley and Calvin in the same body and asking them to agree on everything without degrading into multiple personality disorder. While Providence Foundation did not formally affiliate with other former Maranatha ministries and ministers who later rejoined as Morning Star International/Every Nation, and it appears that Providence Foundation has gone in much more of a Reconstructionist direction than other former Maranatha ministers/ministries, it may be wise to test what Providence Foundation is up to today against its Maranatha history... it might explain a lot.